LIFE After 50 is published on the first of each month by Pendant Publishing. Publication of advertising does not necessarily constitute endorsement of the advertiser’s company, services or products. Bylined columns and articles are the opinions of the writers, and not necessarily those of the publisher. No portion of LIFE After 50, including advertising, editorial material, artwork or photographs, may be reproduced in whole or in part without the written permission of the publisher. 22,500 LIFE After 50 newspapers are distributed at more than 200 grocery stores and locations in Colorado Springs, Black Forest, Monument, Falcon, Manitou Springs, Old Colorado City, Security, Pueblo, Woodland Park, Pueblo West, Cripple, Creek, Florence and Green Mountain Falls. 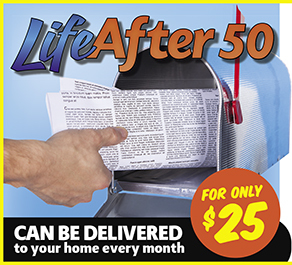 Subscriptions to LIFE After 50 are available for six months – $16 or one year – $25. Prepayment can be made by check, Visa or Mastercard. Call 719-418-2717 to subscribe.